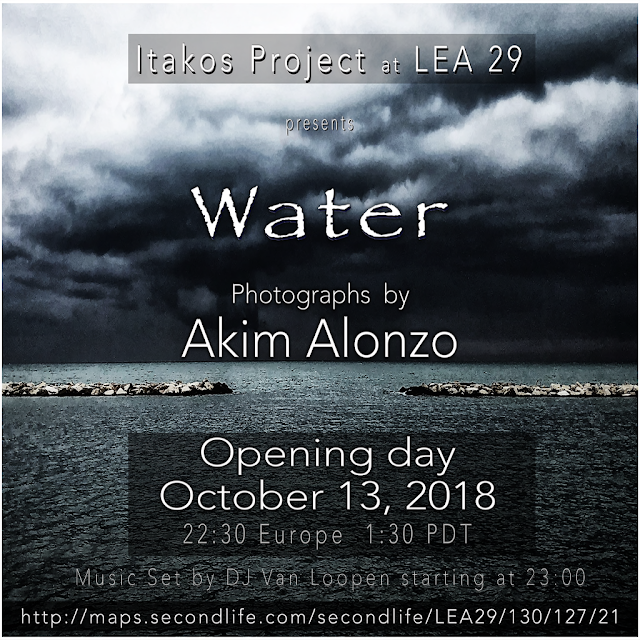 Akim Alonzo is a longtime photographer in Second Life, and returns with this exhibition to communicate with his images on the themes of human emotions and the interpretation of virtual reality through these real categories. Mainly a portraitist, this time he wants to express himself with the virtual landscapes and with the metaphor of the most immaterial element among all, the Water. We are Water and we can not live without it. Sometimes we are like islands lost in the sea, or we float in lush archipelagos full of life. Water brings with it the meaning of survival, it is the immaterial substance of the flowing time, it is the depth of the human soul, of the vital emotions, of joy and fear, fury and tranquility, of solitude and of love. Water moves me, I am Water. Noi siamo Acqua e non possiamo vivere senza di essa. A volte siamo come isole perse nel mare, oppure galleggiamo in arcipelaghi lussureggianti pieni di vita. L’Acqua porta con se il significato della sopravvivenza , è sostanza immateriale del tempo che scorre, è la profondità dell’animo umano, delle emozioni vitali, della gioa e della paura, di furore e tranquillità, della solitudine e dell’amore. L’Acqua mi commuove , io sono Acqua.